Managing long-term pain means relieving symptoms and reducing environmental stress. A hurting kitty is no joke, and the choices can be baffling when your beloved pet is in pain. 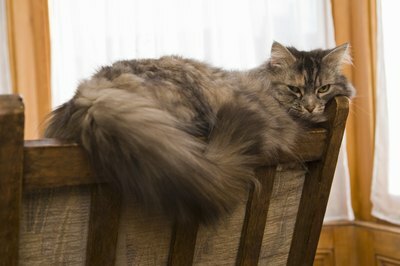 Cats' unique physiology and your furbaby's individual situation govern how your veterinarian and you will work as a team to keep your ailing friend from needless suffering. There's acute pain and then there's chronic pain. How to tell the difference? Well, it's relative. Acute pain is limited to one situation, such as an accident or illness, and as the problem heals, pain stops. Chronic pain is long-term, but it's a continuum -- a serious surgery might cause chronic pain for months but the pain eventually ends, whereas arthritis or cancer can cause chronic pain for the rest of your pet's life. The drugs or other therapies your vet recommends will depend on the expected duration of your pet's discomfort and its cause. Chronic pain can cause an additional problem for sensitive kitties. It can make them hyper-stimulated, so that even normal touch feels super painful. Vets call this "wind-up pain," and it makes relieving chronic pain critical to providing a good quality of life for your furry friend. Even eating and petting become terribly painful to oversensitized cats. The sad fact is that all drugs have toxicity issues and potentially harmful side effects. When Fluffy is in pain, you and your vet will have to weigh these risks against her basic comfort and happiness. Steroids relieve pain by reducing inflammation. They're used for "short-long-term" pain management, like when your cat is recovering from an accident or surgery. Non-steroidal anti-inflammatory drugs are considered safer for truly long-term pain management, but only one -- meloxicam -- is widely considered safe for felines. Please do not use human over-the-counter NSAIDs (ibuprofen, aspirin and others) to treat your kitty, these are terribly poisonous to her. Opiate and opiate-type drugs ("-orphines" and "-anols") are popular for long-term pain management. They're most commonly used in terminal patients due to the potential for side effects in healthier cats. The mildly psychedelic tricyclic antidepressants and NMDA receptor antagonists ("-ines," like ketamine) are very popular for long-term kitty pain relief and are considered very safe for your feline buddy. Do not overlook the power of basic comfort when you're managing your kitty's pain. A warm and cozy, peaceful environment and soft bed can do wonders for aching bones. Some veterinary specialists recommend massage or acupuncture when you're coping with your pet's chronic pain. For your kitty, massage amounts to very thorough and regular petting. Many vet practices have a veterinary acupuncturist on staff who can walk you through treatment options to relieve your kitty's distress. Do not forget the wonders of that fragrant, green herb -- catnip. As long as your kitty doesn't respond with the crazies (which could aggravate injuries), treatment with "medical catjuana" can be pleasant and relaxing.